When we analyze an individual stock or the market as whole, we wonder how our conclusions can be wrong. Lately, we think the current market offers extremely low reward at an extremely high risk. How can it keep going up forever? Only if it finds buyers. 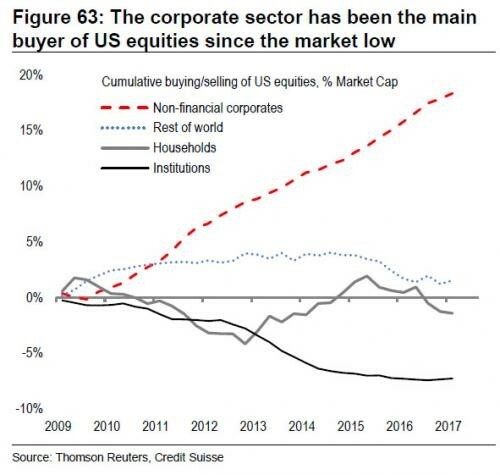 Since the last financial crisis, debt-funded corporate share repurchases have amounted to almost 20% of market capitalization, and they offset net selling across most other investor types. The best example of current times is Restoration Hardware which recently executed a huge and speedy buyback, loading up with debt and propelling its stock 170%+ creating a major short squeeze — while its peers remained flat, and its business fundamentals have been underwhelming. Will anyone replace those buyers? And do they have the capital to do so? Source: Thomson Reuters, Credit Suisse. Many financial advisors will tell you that they are in the business of making money for you. Our practice, on the other hand, calls for preserving and growing family fortunes over generations. The two mindsets couldn’t be more different. We remain loyal to the same clients for many decades, and we care for their financial well-being the same way we do for our own. More conventional money-management firms, if they fail to deliver on their promises, can find new clients and new success with a novel investment idea. We, however, understand that a disciplined, calm, deliberate contrarian approach serves us best in our endeavor. We may not always beat all asset classes or all indexes, but our top priority is preserving capital, and that we do very well. We are not complacent, however: we always question received wisdom, including our own. These disturbing phenomena are generally viewed with indifference in the world of finance, but we suspect they foreshadow the end of an unprecedented bubble. In other words, we are operating in an increasingly risky investment environment that offers decreasingly attractive rewards. On paper, the last 8 years have been a period of the biggest wealth creation in history. In the US alone, total net worth peaked at $68 trillion in late 2007, then dropped to $55 trillion in 2009. From there it soared to reach almost $95 trillion most recently. In a similar scenario, US homeowner equity got cut in half in 2009/10. Since then, in an unprecedented $7 trillion swing, it has doubled. Those are remarkable growth curves considering current weaknesses in economic recovery and productivity improvement, along with the slowest population growth in decades. Our fear is that the most recent boom could be followed by a corresponding destruction of wealth, with potentially disastrous effects on the record number of individuals who will soon reach retirement age. Would their life savings survive a market bust? The world’s governments and central banks are currently faced with three corrective options. They may take actions that produce pain now or later, or actions to prolong the illusion that pain can be infinitely deferred. (Another term for this might be “kicking the can down the road.”) If you were sitting in the dentist’s chair you’d probably choose the last strategy. That’s human nature. But as professionals, we at Sicart are wary of illusion. If our leaders truly normalize fiscal and monetary policy, we’ll see major deflation and explosion of the asset price bubble, followed by a severe depression and massive unemployment. Unfortunately, all that pain might be required to shape a sounder economy for generations to come. If our leaders choose to continue postponing financial pain, we’ll see more weak growth and more market distortions in asset prices, feeding further illusion. Central banks will further expand their mandate beyond inflation and employment targets, and officially start to do all that is in their power to never allow any asset price to fall. This will only take the current absurdity to a whole new level. Unfortunately, a great deal can go wrong with that attempt to defy market and economic cycles by riding the wave of ever cheaper credit and ever more debt. We may think we have escaped the pain of a serious market correction, but it will catch up with us eventually. The Federal Reserve is already a big holder of mortgage-backed securities, propping up assets ranging from our home prices to government bonds. The European Central Bank (ECB) is equally active in government bonds, and has been a big buyer of corporate bonds. In addition the Swiss National Bank (SNB) has been shopping globally, snapping up mega caps in the US (Apple, Microsoft, Amazon, Facebook, and Alphabet, for instance). Meanwhile the Bank of Japan (BOJ) has become the biggest holder of local ETFs (71% of the nation’s ETF market as of July 2017). Propping up the market is nothing new. Conceptually that’s what banker John Pierpont Morgan did in 1907, that’s what was attempted in 1929. However, Morgan’s capital was limited and private. In 2017, we have central banks with unlimited buying power and unlimited options. The ECB took 12 months to even disclose what they’ve been buying in the corporate bond market, and did so only under pressure. If we count the assets of the 10 largest central banks, Bloomberg reports, the total amounts to $21 trillion in central bank assets or 30% of the world economy; or 1/3 of the world market capitalization; or 1/3 of official world public debt, or the total value of the US stock market. How much is too much? The other difference between the present and the era of J.P. Morgan’s intervention in the market is the duration. In 1907, it was brief. Today, however, the central banks’ involvement in markets can prop up prices for almost a decade, and there is still no end to it. Needless to say, such a long period of market distortion only creates an ever-bigger gap between the reality of market forces and the illusion created by monetary and fiscal wizardry. The biggest leveraged buyout (LBO) in history? Biggest market rally ahead? 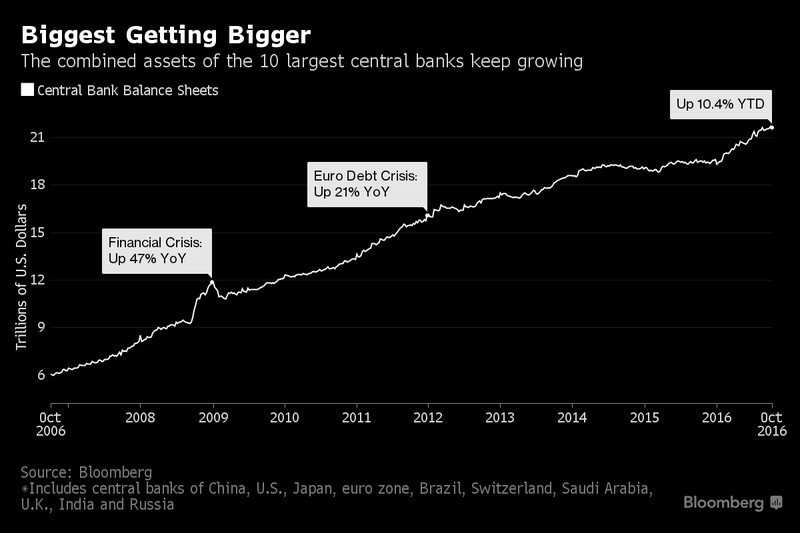 Could central banks buy another $50 or $100 trillion of anything they want at whatever price they want? Of course, they could. If they did, asset prices could continue to climb. Could the central bankers take all public markets in all securities private? Interest rates are set at zero, credit is free, risk premium is a forgotten concept, printing presses are allowed to run full speed. What’s more, central banks can buy and hold almost everything: government bonds, mortgage-backed securities, corporate bonds and equities, on top of what John Maynard Keynes referred to as – “barbarous relic” – gold. In fact, we are transported to the last days of the failing centrally-planned economies of Central and Eastern Europe. Back in the late 1980s local currency had no credibility as a store of value so people’s savings were in US dollars (referred to as “hard currency” and treated with the utmost respect). There were no public equities, no bond market, and real estate was most often leased rather than owned. Is that where we are headed? What will be our hard currency this time? If central banks eventually own all assets, any former asset-holder will be sitting on a lot of newly printed cash with nothing to spend it on. What do you call a time when too much paper money is chasing too few goods? Hyper-inflation. The IMF, studying the early-1990s policies in Central Europe concluded that “cheap credit, fiscal deficits financed by central banks had led to near hyper-inflation.” Having witnessed that economic experiment at first hand, I sincerely hope we are not headed that way. To undo the damage of the centrally planned economy in Central Europe almost 30 years ago, the IMF set a fundamental rule for the governments – it forbade the national central banks to finance government budget deficits and forbade the issue of new currency. Isn’t this the very rule that all major “free market” countries violate so openly these days? Is it time to reinstate that old rule? Year-to-date, despite the supposedly improving economy and inflation picking up, central banks bought $1.5 trillion in assets with BOJ and ECB leading the race. If they keep up the same pace throughout the rest of the year, this will be the biggest buying spree in a decade. Something tells us that new highs for the stock market may have something to do with it. Lately, the Fed has alarmed some observers with talk of tightening and balance-sheet shrinking, but we wouldn’t bet on policies normalizing anytime soon. In our definition, that means the Fed going back to its original role – lender of last resort, allowing the market to freely set interest rates reflecting true investment risks across the full spectrum of assets. Revolutionary idea? Hardly. The same way the market sets prices of thousands if not millions of goods and services every day without the help of a dozen wizards secretly contemplating the next price change and communicating in codes causing the markets to whipsaw as central bankers “recalibrate the message” each time. It was probably the clearest, and shortest answer anyone has ever gotten from Dr. Greenspan, who once famously said: “I know you think you understand what you thought I said but I’m not sure you realize that what you heard is not what I meant”. We know what he meant this time. It’s never been more difficult to be a central banker – never the stakes have been higher, never the dilemmas bigger. We’ll take Dr. Greenspan’s frank response over recent Dr. Yellen’s comforting assurance of no financial crisis in our lifetimes. Those kinds of declarations seem to be usually very poorly timed, like Dr. Bernanke’s 2007 calming commentary or the words of the legend himself – John Maynard Keynes who told us in 1927: “We will not have any more crashes in our time”. The current misguided monetary and fiscal policy can last for a long-time, and central bank can establish themselves as buyers of last resort vs. lenders of last resort which was the intended role at their inception. This economic experiment will eventually have to end though. The lesson here is not that capitalism or the free market economy has failed us. it’s that statism, government interventionism, and central bank manipulation always eventually fail as they have done too many times before. The free market and capitalism haven’t had a chance to breathe in a while. No one can tell just when the stock market will peak, but this is not a good time for complacency, passivity or paralysis. We wish smart decisions, good luck, and patience to everyone with a small or large fortune at stake. The next 40 years will be very different than the last 40, and likely the next 5 won’t be like the last 5.